WR A.J. Green caught a touchdown pass to open the scoring, but QB Aaron Rodgers would respond with a touchdown to TE Lance Kendricks. However, the Bengals would take a double-digit lead to end the half on the strength of a HB Giovani Bernard touchdown catch and a CB William Jackson 75-yard interception return for a touchdown. The Packers would make a comeback effort in the second half, scoring two WR Jordy Nelson touchdown catches and a field goal to force overtime. 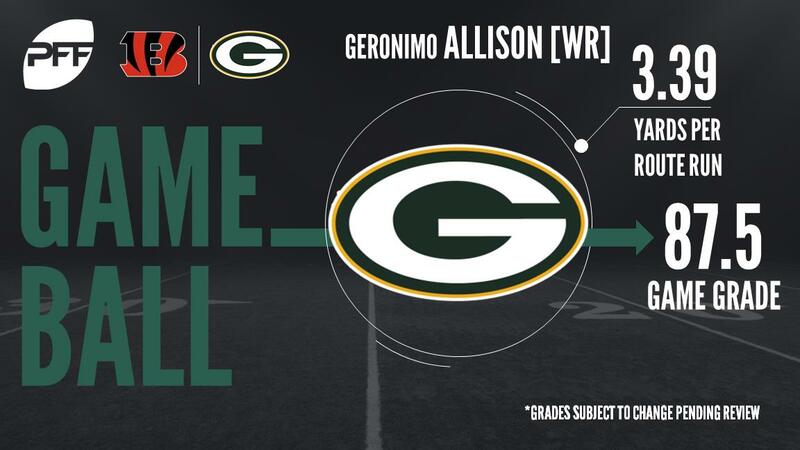 WR Geronimo Allison would set up the game winning field goal for the Packers and they would go on to win 27-24. With that, we give you our PFF exclusive takeaways from the contest for each team. It wasn’t looking good after a poor first half, summed up by a terrible pick six. But Rodgers is one of the games greats, and in the second half he showed just exactly what he is made of. When the team needed big plays he made them, first hitting Jordy Nelson to take the game to overtime, and then putting Geronimo Allison in position to move them into field goal range. Rodgers was particularly on point when the Bengals didn’t blitz, completing 24-of-36 for 316 yards and a touchdown. He had a rating of 101.4 when not under pressure. After doing enough in his debut, the Packers felt a little bit more confident in their passing game and the result was deeper dropbacks, longer developing plays and a lot of one-on-one action for Murphy at left tackle. On the evidence of his one sided battle with Carl Lawson, if he has to start again that will change. Murphy was beaten for two sacks (and another called back by a penalty) while giving up a further seven hurries. He struggled to anchor against Adrian Clayborn on Sunday night, and Lawson was only too aware, overpowering him with alarming consistency. The Packers have a multitude of defensive backs that they’re able to use in a variety of ways, and it was one of those who stood out this week. Jones made his debut against Atlanta but went from playing 50 percent of snaps then to not missing one here. The end result of the increased playing time was something to behold. 11 tackles, two sacks and eight defensive stops highlighted an all action display that was crucial in the Pack staying alive. Last week it was Kevin King who impressed, but he had a difficult outing this week (29.3 grade), so the question for Jones is what will he do on Thursday Night? After featuring on 46.4 percent of defensive snaps a year ago, Martinez is up to 75.6 percent through three weeks. This was arguably his most competent performance as a pro, and while not perfect he showed the kind of instincts to ruin a number of running plays. He ended the day with seven defensive stops and renewed belief that he can be a linchpin of this defense for years to come. A game that might be remembered for the plays Dalton didn’t make, as the signal caller got the ball in his hands numerous times in the fourth quarter but he was unable to put away a Packers team that looked to be on the ropes. But it was a big step forward for him and offense as a whole, as Dalton was efficient (22 out of 28). Yet he perhaps wasn’t varied enough, and you can draw your own conclusions that of his 28 pass attempts, only one of them went outside the left numbers and only three went further than 20 yards. New offensive coordinator, old A.J. Green. The team made a big effort to get their biggest playmaker in position to do what he does best and he duly responded. He caught 10 of 13 balls thrown his way, with rookie Kevin King in coverage on four of those catches for 59 yards as he worked over the second-round pick. This game was a promising step forward and with John Ross set to return and Tyler Boyd getting healthy, you’d have to think this aerial attack is only just beginning to show what it is capable of. Through three games Lawson has flashed his potential, with seven total pressures in his opening two games. Well given his largest share of playing time to date (53 snaps) and a tasty matchup with Kyle Murphy, he fully broke out with three sacks and seven hurries in a big effort. Lawson was something of a draft day dropper much to our surprise, with him always a consistent performer at Auburn. Now, with a chance to pin his ears back and get after the quarterback, he’s proving he has the kind of explosion that is going to cause a lot of problems for offensive tackles. Jackson didn’t qualify for a top five grade because he only played 15 snaps, but more efforts like this and he’ll see a lot more going forward. The former first-round pick had managed just 29 career snaps since being drafted in 2016, but with a big pick six of Aaron Rodgers and some good work up at the line of scrimmage in the run game, he’s surely done enough to get more.